We’d love your help. Let us know what’s wrong with this preview of Wheels of Change by Darlene Beck Jacobson. To ask other readers questions about Wheels of Change, please sign up. Wheels of Change is a wonderful, well-written, heartwarming book. I wouldn't be surprised if it won a big children's book award. It take place in Washington DC during 1908, so it is a historical fiction novel and it is filled with vivid details of the time. The main character is Emily Soper who is the twelve year old daughter of a carriage maker is a gusty, quick-thinking young girl. Everything is changing. The industrial revolution has started. Automobiles are replacing the horse and carriage. Wheels of Change is a wonderful, well-written, heartwarming book. I wouldn't be surprised if it won a big children's book award. It take place in Washington DC during 1908, so it is a historical fiction novel and it is filled with vivid details of the time. The main character is Emily Soper who is the twelve year old daughter of a carriage maker is a gusty, quick-thinking young girl. Everything is changing. The industrial revolution has started. Automobiles are replacing the horse and carriage. It's been 40 years since The Civil War, but racial intolerance still looms within the neighborhood. Emily struggles to cope with how the changing times affect the family carriage making business and the bigotry the of the times. The voice is unique and strong, the characters are relatable and well-defined. The story will grab your heart. Darlene Beck-Jacobson really captured the feel of the times and the angst that surrounded it. It is a great mix of fun, sorrow, angst, and suspense. Emily Soper's Papa is a carriage maker, the best carriage maker in all of Washington, DC. He makes carriages for important people, like John Philips Sousa and even President Roosevelt! Emily loves spending time in the barn and hopes her father will one day allow her to help build carriages. Beatrice Peabody, the meanest girl in school, boasts about her uncle's automobile and how thanks to Mr. Ford's assembly line, more people can buy them. Beatrice believes Emily's Papa will soon be out of busin Emily Soper's Papa is a carriage maker, the best carriage maker in all of Washington, DC. He makes carriages for important people, like John Philips Sousa and even President Roosevelt! Emily loves spending time in the barn and hopes her father will one day allow her to help build carriages. Beatrice Peabody, the meanest girl in school, boasts about her uncle's automobile and how thanks to Mr. Ford's assembly line, more people can buy them. Beatrice believes Emily's Papa will soon be out of business! Emily can not let that happen. Why can't everything stay the same? Well, some things can change, like her mother's attempts at making Emily more ladylike and other people's' attitudes towards Henry, her father's "colored" blacksmith, but carriages? They should definitely remain. Emily sets out with a plan to save her father's business. Despite setbacks, she never stops trying to reach her goal. She may even find a new goal along the way. This is a very carefully written novel about the social changes of the turn-of-the-twentieth-century. In 1908 the social issues involved automobiles, women's rights and racism. I found spunky Emily a character easy to relate to. I really liked her and how she tried to make sense of her changing world. However, as an adult reader, I found the messages in this book WAY too heavy handed. Though I certainly agree with the sentiments expressed by Emily and her family, they're too forced and modern for 1908. The attitudes towards women and African-Americans were either or, making the characters very black and white. Emily is a child so naturally her world is black and white but I was hoping for more nuanced characters. Emily's mother reveals a few surprises and while she is a loving mother, her attempts to make Emily ladylike are so typical of novels for this age group set during this time. The mean girl, Bea, naturally has a reason behind her behavior and naturally, her mother is revealed to show one face to the public and another in private. Again, this plot is very typical of middle grades novels. WHEELS OF CHANGE For me, time to read fiction has become a luxury—a rare occurrence. When I come across a book that makes that experience all I want it to be—that book is a gift. Such a gift was given me when Darlene Beck Jacobson’s book Wheels of Change made its way into my hands. From the steady “buzz” about this book, I was more than eager to read it, yet life continued getting in the way. A week passed when I finally sat to read more than just a few pages I’d snatched in snippets. Once I be WHEELS OF CHANGE For me, time to read fiction has become a luxury—a rare occurrence. When I come across a book that makes that experience all I want it to be—that book is a gift. Such a gift was given me when Darlene Beck Jacobson’s book Wheels of Change made its way into my hands. From the steady “buzz” about this book, I was more than eager to read it, yet life continued getting in the way. A week passed when I finally sat to read more than just a few pages I’d snatched in snippets. Once I began, I found myself swept in by the current of compelling characters, believable setting, beautiful, fresh similes and a story I couldn’t resist. I would’ve read through the night, had my heavy eyelids not won the battle. The following morning, before even setting foot out of bed, I found myself turning pages. The demands of my day pulled me away, but that night I gobbled up nearly the rest of the book, again awakening the next day to finish. What a read! Having been inspired by a couple of facts and events from the author’s family history, Darlene Beck Jacobson weaves a savory tale told through the eyes of a 12-year-old living at the turn of the 20th century. Emily Soper is a spunky, willful girl, whose heart and mind, at their core, are filled with loyalty, fairness, kindness—and love. Living in Washington, D.C. in 1909, on the cusp of great changes in the United States, Emily struggles with her ambivalence over these changes. She welcomes the possibilities of women expanding their choices and rights, seeing as she herself desires doing what are considered jobs for men—like blacksmithing for her father’s carriage-making company. She is indignant, especially concerning the injustices against people of color, caring so much for the men who work for her father—her friends. She frets over what effect the new-fangled invention of the motor car will have on Soper Carriage Works. Through her mastery of storytelling, Beck Jacobson takes us along for a breathtaking “carriage ride” as Emily shoulders the weight of these many concerns, driven by the desire to help those she loves. Her actions, though largely intelligent and thoughtful, are often impulsive, having both positive and negative consequences. One of the traits I find most appealing is Emily’s steadfastness about what she considers “right and wrong.” Her determination to right these wrongs knows no bounds, as she goes so far as to attempt contact with the most powerful man in the country: President Theodore Roosevelt. Recommends it for: Children ages 8-14 and any lover of Middle Grade and Historical fiction. Growing up in a time of change and hardship is never easy, especially when you’re young. Twelve-year-old Emily Soper lives in the early 1900s in Washington, D.C, a time when she was expected to be prim and proper and act accordingly. She witnesses racial and gender mayhem as well as a development of technology and tries her hardest to keep up with all of the changes. Raised by her hard working father, a carriage maker who manages Soper Carriages, and her mother who stays home to care for the chil Growing up in a time of change and hardship is never easy, especially when you’re young. Twelve-year-old Emily Soper lives in the early 1900s in Washington, D.C, a time when she was expected to be prim and proper and act accordingly. She witnesses racial and gender mayhem as well as a development of technology and tries her hardest to keep up with all of the changes. Raised by her hard working father, a carriage maker who manages Soper Carriages, and her mother who stays home to care for the children, she grows up under the rules of the twentieth century that all girls will grow up to work in the kitchen and become proper ladies. Gutsy and determined, and not at all like the other girls in town, Emily spent much time in her father’s carriage barn where she could get her hands dirty and experience something new and exciting, rather than the run of the mill lessons in the kitchen. Despite her admiration for her father’s work she is scolded and experiences a time when even her parents begin pushing her to follow the crowd and respect the rules of the century. During this day and age, Emily sees how the world had transformed and witnesses the invention of the automobile, one of the true antagonists of the story and the reason why the public abandons Soper Carriages. It was at this moment when the reader realizes how much change can effect even the smallest and youngest of individuals, and how hard it is to undergo, especially if it simply isn’t one step, but a huge leap forward. As the reader delves into the story, Emily’s plans to save her father’s business begin brewing. She is tested by many trials of courage and tries her best to save the family business while also learning how truly important it is to grow up. ‘Wheels of Change’ is not only a fabulous and authentic historical read, but also one that had me hooked from the very beginning. The storytelling is strong and vivid and invites the reader in to relate to each of the characters. It’s a classic middle grade novel that children will love reading for years to come and one daring adventure I will never forget. I love a good historical read, and this one hauled me in from the very beginning. I especially relished the sensory details in the opening pages. I also really enjoyed the family dynamics, and the smaller moments really sparkled in the pages (in one of my favorite scenes, Emily's mother helps her hang a horseshoe for luck). Jacobson smartly juxtaposes the changes in young Emily's personal life (she's slowly leaving behind childhood and making steps toward becoming a young woman) with larger chan I love a good historical read, and this one hauled me in from the very beginning. I especially relished the sensory details in the opening pages. I also really enjoyed the family dynamics, and the smaller moments really sparkled in the pages (in one of my favorite scenes, Emily's mother helps her hang a horseshoe for luck). Jacobson smartly juxtaposes the changes in young Emily's personal life (she's slowly leaving behind childhood and making steps toward becoming a young woman) with larger changes in the outside world (racial and gender upheaval as well as technological advancements). Emily can't keep the demands of turn-of-the-twentieth century womanhood at bay, nor can she keep the world from driving automobiles and abandoning her father's glorious carriages. But the reader will absolutely be glad that Jacobson takes us back to revisit this moment in time. A lovely tribute to Jacobson's family (text at the end indicates that the book is partly based on family history). Highly recommended. Great cover for a fun book! Authentic historical details give readers a flavor of a period not often covered in historical fiction for kids, the start of the automobile age. Emily's spunky determination to save her father's business and her easy, comfortable relationship with an African-American blacksmith are endearing. A good read! Though I am not the biggest history buff I felt this novel did a decent job portraying the time period. I do know however it was extremely fictionally based which made the novel seem a bit immature to me. This book is set in 1908 and follows Emily Soper. Her father made carriages and in a world in which "a woman's place was In the home" she didn't feel she had much options. The story makes you realize all we have now is because of what happened then. With the prejudices and the hardships. It teaches us how change affects everyone whether it is the creation of a motorized carriage or how we treat our neighbors. Well, thank you, Storm Stella! I hunkered down and read Wheels of Change by Darlene Jacobson. What a beautiful middle-grade historical spun out of family lore. Perfect for those 1900-1919 years when there were so many, many new inventions and contraptions up against age-old conventions. Simply wonderful! I picked this up on a whim off the used book shelf at our library for my daughter and I to read and we were absolutely entranced. The story took us back in time and really immersed us in Emily's world and issues of the time period. I liked the vocabulary lessons found throughout the book- they just added to the fun of the book for us. We were so sad the book was over! I loved reading the story of Emily Soper and being swept up in her life in the early 1900s. I couldn’t put the book down. Works. Twelve-year-old Emily Soper worries for her parents, as well as herself. what people then felt about these changes. The story is so immediate and poignant that while reading, I felt I was living back in those times. As a child, historical fiction was my favorite kind of book. And I’m still fascinated to look inside the lives of people from the past. Emily, with her cheerful, feisty personality, struggles to incorporate the big societal changes going on all around her, all the while making big personal changes of her own. She’ll have you cheering for her to the end! Every child should be inspired by Wheels of Change—and discover why you don’t need wings to fly! A must have for parents, teachers and librarians! Emily is a precocious young girl growing up in Washington, D.C., at the turn of the century. The year is 1908, and her Papa is a skilled blacksmith, creating beautiful carriages in his workshop. Emily loves to be there, watching the workmen and helping with small tasks, but her mother is determined to turn her into a lady. She is especially excited when Papa is commissioned to design and build a majestic carriage for none other than President Teddy Roosevelt! Yet, times are changing. Motor cars Emily is a precocious young girl growing up in Washington, D.C., at the turn of the century. The year is 1908, and her Papa is a skilled blacksmith, creating beautiful carriages in his workshop. Emily loves to be there, watching the workmen and helping with small tasks, but her mother is determined to turn her into a lady. She is especially excited when Papa is commissioned to design and build a majestic carriage for none other than President Teddy Roosevelt! Yet, times are changing. Motor cars are becoming a more frequent site on the streets of the city. Emily can see that her parents are worried about their future. Carriages may not be needed for much longer. On top of all that pressure, some townsfolk have a problem with one of Papa's hired men, who just happens to be a black man. While he is practically family to Emily and her Papa, prejudice rears its ugly head and nearly destroys the family business in the process! The book also touches on the place of women at the dawn of a new century, fighting for their right to vote. I enjoyed this middle grade story not only because of the skilled storytelling of the author, but also because Emily is a character that kids today can easily relate to. At twelve years old, she is just beginning to realize that the coziness of her happy home life will not necessarily ensure security in the outside world. Circumstances and people run along, out of our control, and to survive we have to learn to adapt and rely on resourcefulness and creativity. I also am always thrilled when a middle grade reader does not talk down to younger readers. Ms. Jacobson kept the dialogue and vocabulary age appropriate yet just challenging enough to stretch the young reader's mind. There are too many middle school level books that oversimplify words and sentence structure. 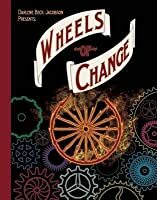 I was so excited to read Darlene Beck Jacobson’s new middle grade book Wheels of Change. Some of you might recognize Darlene as the author of the popular blog Gold From the Dust: Bringing Stories to Life. Wheels of Change tells the story of sixth grade Emily Soper who lives in Washington D.C. at the turn of the century. For a twelve-year-old, Emily faces some pretty heavy stuff. Her favorite teacher is a suffragist, her frenemy’s mom is racist and Emily herself is embroiled in a daily battle with I was so excited to read Darlene Beck Jacobson’s new middle grade book Wheels of Change. Some of you might recognize Darlene as the author of the popular blog Gold From the Dust: Bringing Stories to Life. This is an outstanding book. I had the great honor to preview it. I had a general idea of the story line beforehand, but was pulled into the book almost instantly. I am very impressed by the depth of characterization for a book written for children. Beck Jacobson manages to cover some very important social and technological changes in the world without making the history laborious. One feels as though he/she is living the experience. I loved the young heroine - she is very real, Her daily intera This is an outstanding book. I had the great honor to preview it. I had a general idea of the story line beforehand, but was pulled into the book almost instantly. I am very impressed by the depth of characterization for a book written for children. Beck Jacobson manages to cover some very important social and technological changes in the world without making the history laborious. One feels as though he/she is living the experience. I loved the young heroine - she is very real, Her daily interactions are ones to which children can relate, even though the time is different and her responsibilities in many ways are foreign to today's youngsters. Just enough explanation is given to make it all clear, once again, without interrupting the story. Most likely the young readers will want more - sequels or other books covering equally important changes. I devoured this book. Set in historical Washington D.C. when races mixing was still taboo, Emily Soper learns a lot about adapting to the world through events that happen to her family, friends, and herself. I found the writing to be beautiful yet still realistic. I could picture myself there, peeking through a window, and watching it all unfold. I can see this book winning awards and someday, rotating through the public school system as reading material. This is a book I will read more than once I devoured this book. Set in historical Washington D.C. when races mixing was still taboo, Emily Soper learns a lot about adapting to the world through events that happen to her family, friends, and herself. I can see this book winning awards and someday, rotating through the public school system as reading material. This is a book I will read more than once in my lifetime. It brings to mind some of my favorite books of that era including The Color Purple and Gone With the Wind. The only bad part? I didn’t have any peach pie while I was reading it! Thankfully, recipes were included at the end! This is a great historical fiction novel that takes place during a time not often discussed in elementary or middle school social studies-- early 20th century. The main character is a young girl whose father makes carriages right around the time that Henry Ford and automobiles are threatening this business. The story also touches on racial and gender inequality in a way that makes sense with the story and the characters. Recommends it for: Everyone! Terrific book! I LOVED this book. It has a timeless feel, akin to Laura Ingalls Wilder’s Little House on the Prairie, and from page 1 you find yourself rooting for 12-year old Emily Soper, who unlike some of the adults in her life, is unafraid to take a stand for what is right. What makes this book even more special is that it was inspired by the real life experiences of the author’s grandmother, Mary Emily Soper. I highly recommend it. When a carriage maker faces changes, his daughter decides to help out by writing to the President. This results in Mary Emily Sopher being invited to the White House by President Roosevelt. Retold from the history of authors family, this is a wonderful book for Middle Grade readers exploring several aspects of the time. Darlene Beck Jacobson's Wheels of Change is an engaging, beautifully written historical middle grades novel that this adult reader couldn't put down. Young Emily Soper navigates Theodore Roosevelt's Washington, DC, with energy and determination as the city and the nation go through huge changes in both transportation and social attitudes. The best works of historical fiction are the ones that really put you inside the era/people they are trying to describe. "Wheels of Change" by Darlene Beck Jacobson does exactly that, managing to make readers feel as if they are actually living in the Washington D.C. of 1909. The basic premise of this book centers on young Emily Soper and the struggles of her blooming adolescence and curious mind. When her Papa, an esteemed carriage-maker, begins an order for President Teddy Roosevelt himself, Em The best works of historical fiction are the ones that really put you inside the era/people they are trying to describe. "Wheels of Change" by Darlene Beck Jacobson does exactly that, managing to make readers feel as if they are actually living in the Washington D.C. of 1909. The basic premise of this book centers on young Emily Soper and the struggles of her blooming adolescence and curious mind. When her Papa, an esteemed carriage-maker, begins an order for President Teddy Roosevelt himself, Emily is over-the-moon excited. The problem? All Mama wants to do is turn her into a lady...something Emily desperately wants to avoid! A few other things she can't understand: Why her neighbors are so casually racist, as well as why these newfangled contraptions called "automobiles" may be threatening their entire family's well-being. The most enjoyable part about reading "Wheels of Change" is that even though it is told from a child's (12-year old) perspective, author Jacobson manages to weave in very mature themes (racism, progress, family, etc.) without alienating adults from enjoying the book. I am 28 years old, and I'm sure I loved this book for many different reasons than, say, a young adult would. I think that a big part of this success has to be the book's ability to create such a strong sense of family. The family isn't perfect, nor are they dysfunctional. Rather, they live in that grey area that better describes everyday life (whether 1909 or the present). A very Walton-esque feel to the family values, which I consider a badge of honor. Wheels of Change transports the reader to the early 1900s in Washington, DC where Emily worries about personal problems (her father’s struggling business, her mother’s insistence on learning proper housekeeping) as well as larger issues (racial tension, women’s inability to vote). Beck Jacobson manages to weave in lots of fascinating details from the time period without weighing down the story. The result is an entertaining book that brings history to life. I am getting back to the old habit of reading books with this one. Over the years, I've lost my ability to focus but the book is thin enough that I could read it through in one sitting. It is a lovely collection of inspiring anecdotes, lightly and charmingly told despite the importance of the subject. Beck Jacobson takes her readers into an era that usually overlooked- when Teddy Roosevelt was president. A young girl wants to follow in her father's footsteps- during a time when they weren't encouraged or allowed. A fresh read! A beautiful coming of age story of courage, with great lessons throughout the text. My class really enjoyed the book as well. Wheels of Change was an extraordinary book about a family trying to cope with the changing world and the technology revolution of the time. The author developed the main character of the book really well. The book also does a really good job of introducing kids to issues of women’s suffrage and racial discrimination, both of which were prevalent in early 1900s. I did find some parts of the story a little repetitive, but otherwise the book is very well-written. Emily Soper is a unique girl who wants to live her dream. However, women in the early 1900s aren’t allowed to pursue their dreams- instead they are taught how to be “lady-like.” Emily loves spending time at her father’s barn which also serves as the workshop for her father’s carriage-making business and nothing can keep Emily away from the forge. There are two other people who work at her father’s business: Henry, an African-American blacksmith, and Sam, their Caucasian neighbor, both of whom are like brothers to Emily. She also has a younger brother, William, who is really very naughty but their mother never says anything to him. The story is set in a time when automobiles are just starting to be produced, and Emily and her family fear that their business will be shut down due to the decrease in demand for carriages. However, President Roosevelt orders a carriage from Emily’s father which turns out to be one of their biggest projects. This boosts the family’s faith in their business and the Sopers’ start to believe that their luck could take a turn for the better. Will Emily’s father let her help him? Will the President’s carriage be completed? Emily loves hanging out in her father's shop, and enjoys talking to Henry, the blacksmith. Her father has just made a carriage for Sousa, and has been commissioned to build one for President Roosevelt himself. When Henry becomes very ill, her father has to hire another man, and with the advent of the "horseless carriage", Emily fears for the future of the shop. Emily's mother wishes she would not hang around the forge and enlists her help to put together a tea, for which Emily must improve her b Emily loves hanging out in her father's shop, and enjoys talking to Henry, the blacksmith. Her father has just made a carriage for Sousa, and has been commissioned to build one for President Roosevelt himself. When Henry becomes very ill, her father has to hire another man, and with the advent of the "horseless carriage", Emily fears for the future of the shop. Emily's mother wishes she would not hang around the forge and enlists her help to put together a tea, for which Emily must improve her baking, not to mention her manners. Emily starts to see more change than just the automobile-- she sees Suffragettes out, goes to a Nickelodeon and sees a woman playing the piano, and sees even more prejudice against black people than she saw when her family chose to visit Henry at his home. In the end, the most pressing problem-- the continuation of her father's business-- is solved, Emily is invited to meet President Roosevelt, and the family decides that they must do what is right even in the face of others' opinions. Strengths: There is not a lot of fiction set during this period of history (1901-09) when there was a lot of social change occurring. This is well researched and based on the author's own family history. Lots of different topics of the day are presented.